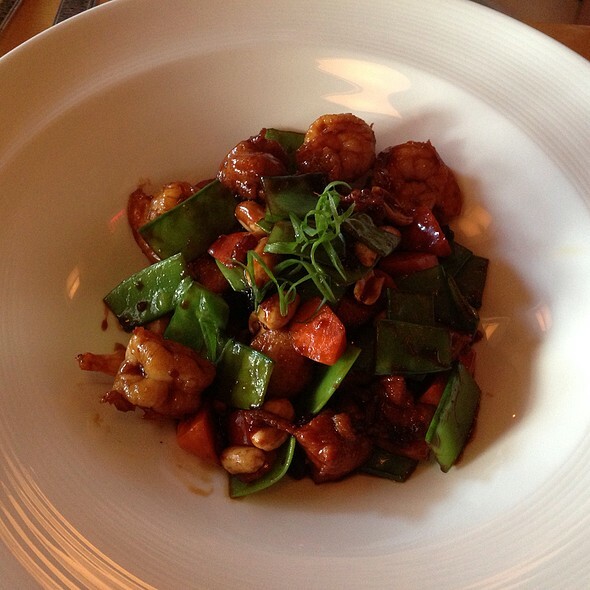 Red Ginger is more than just a place to eat. It is an elevated entertainment experience! There is energy in Red Ginger’s dining room unlike any other location in Northern Michigan. The lively design and metropolitan atmosphere will transport you. Our exceptionally talented and welcoming staff will remind you that you are as close to home as you will ever be. 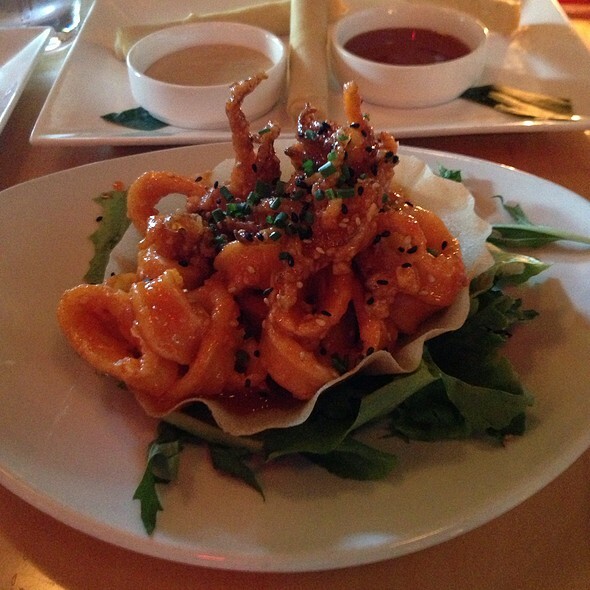 tempura shrimp, spicy mayonnaise, "rice krispies"
This is one of our favorite restaurants. The service is typically great, although this visit our waiter was a bit overly solicitous. And the food is almost always great, but my wife did feel like her Shaking Beef was much fattier than usual. All things considered, however, especially our many past experiences, it was a wonderful evening. And the staff outdid themselves in making my wife feel special for this birthday dinner out. Overall, I had a great experience. The sushi was amazing. We had the chef Dan special and the ginger roll. The drinks were strong. I had the red ginger sangria and my husband had the Manhattan. The crab dip appetizer was AMAZING. I just think our main entrees were under seasoned. Like, they relied on the curry sauces for the flavor but the other components on the plate were underwhelming. We had the Thai curry and the Tomahawk pork chop which was a special meal for that night. Our server was a little slow and had a hard time multitasking. Fortunately, we were in no rush since it was an anniversary dinner. But like I said, overall was a good experience and I would return. The atmosphere is great, the food is amazing and our waiter, Ernest, was fabulous. Looking forward to coming back on our next visit. I was quite disappointed with our seating - at the time I made the reservation, I requested a booth or table where we could converse quietly. Instead we were seated in a crowded, noisy location with other diners at our elbows. Consequently, I felt unwelcome and treated indifferently. We had a great experience celebrating my Wife's birthday at Red Ginger. Their service is always excellent and we really enjoyed some of the unique mixed drinks from the bar on this visit - well done bar tender :)! Our server made us feel special and took care of everything without ever making us feel like he was working at it even though he had tables all around us as well - well done server!! The food was great and innovative and we loved the whole experience! As always delicious food and excellent service. Not too busy on a Monday night so we got right in. Great food and great service! We really enjoyed our dining experience! The lobster fried rice is wonderful! Went here on a friend’s recommendation and we were not disappointed. I always enjoy Red Ginger. Delicious food and classy atmosphere, service is always good. The birthday cards are a nice touch. Perfect place for occasions. Always have a great meal delivered by great friendly staff. 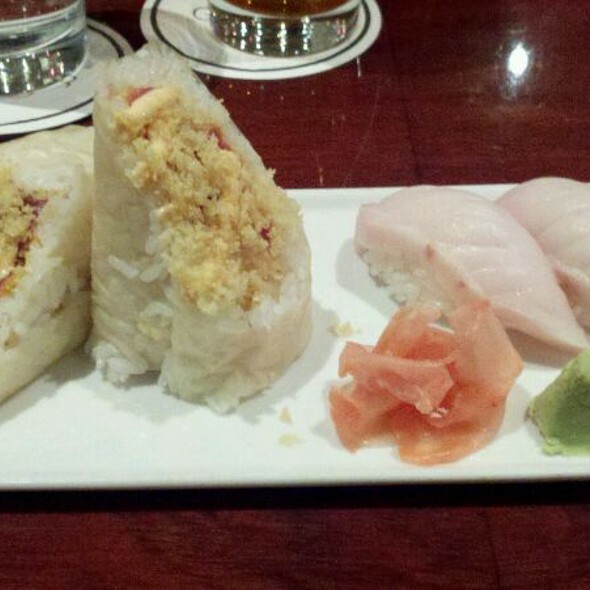 I enjoyed Red Ginger for my first time trying sushi! I was not a fan of the tuna maki, it was a little more bland then I was expecting but I also was unsure of what to order as it was my first time ever having sushi! The ambiance was excellent for our girls weekend! It wasn’t too loud but we also weren’t out of place with our laughter and passionate conversations! The drinks were nice and strong for a relatively good price too! Over all extremely enjoyed my time here and will be back again in the future! We always have a consistently good meal here. I always get the Sea Bass, just love it! 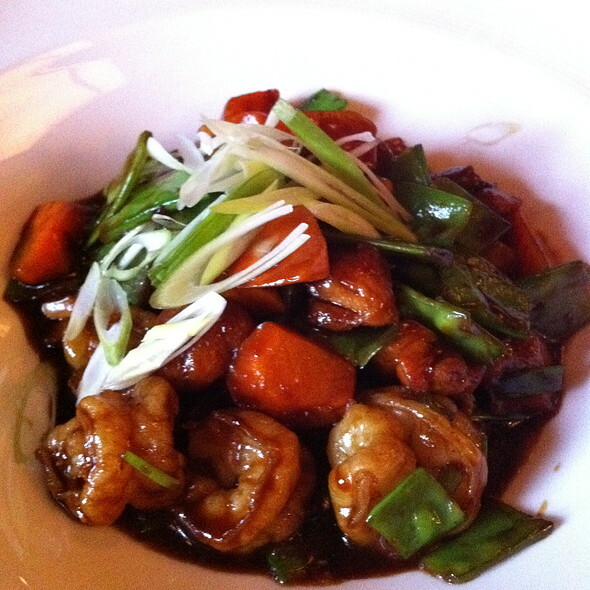 We love Red Ginger! This is always a fave when we are in Traverse City. Excellent food and drinks as always. Also, amazing service. Great restaurant. Loved the atmosphere and the food was superb. Had a bar area for a more casual dining experience or you could sit away from the bar. Food was great and the service from our waiter was fantastic. The dining experience is elevated to another level whenever you deal with a waiter who acts like a professional! And that is what we received! Good food. Sushi rolls looked small and my fellow guests said they'd had better/ larger rolls elsewhere. Thai curry dish was AMAZING!! MISO soup was delicious...I wanted to take some home but never got my quart sized carry out at the end of the night... just a check and another wait staff person took care of our bills. Our waiter got busy with other tables and no one came back to thank us for coming, say goodbye, ask if we needed anything else...(like my soup?) I'd definitely go back however. 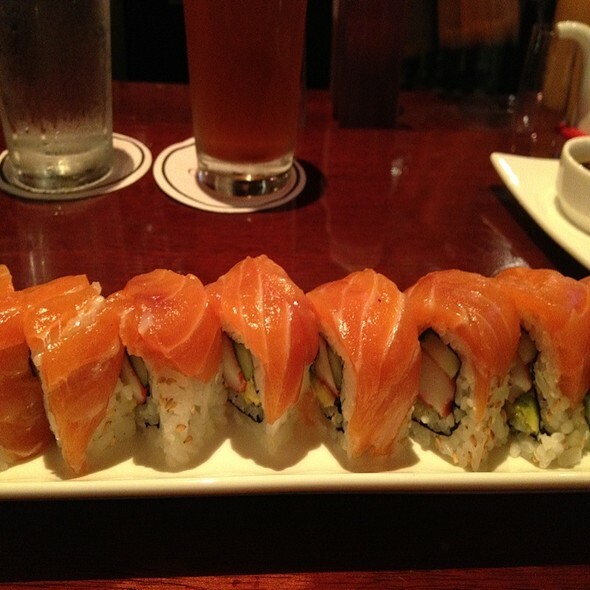 We always have a good time and a great meal at Red Ginger. The atmosphere is very good. 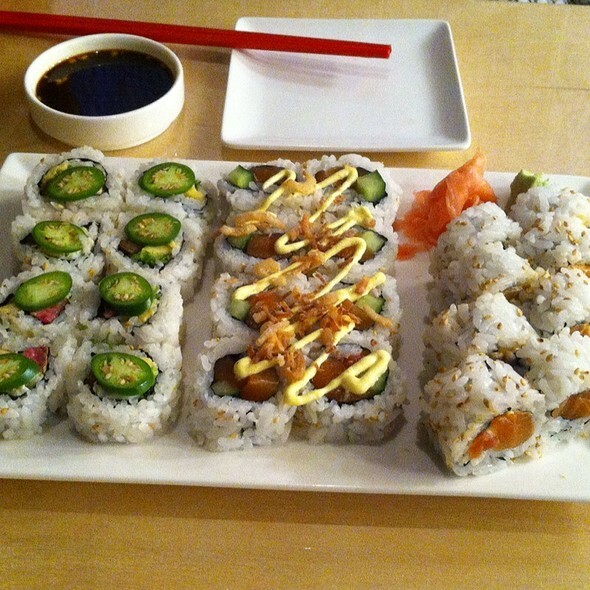 The sushi is not the best I've ever had, but very good! Would return. I have been burnt out on forgetful servers, cold food, terrible presentation and atmosphere that makes you want to just stay in. Friday night Red Ginger gave me hope. First step to ensuring a good experience is to make a reservation- No better feeling then walking in and sitting down right away like you own the place. The rest of the experience is up to the restaurant. Our server was busy, as it was peak dinner time, but was visible 90% of the time and very attentive and never made us feel like an inconvenience. Service was on point, presentation was great, food was delicious and libations did their job. Atmosphere was excellent and love that they do try and hold the customer to some sort of dress code. I wish we had more expendable income so we could just make Red Ginger our "go-to" place! As for now it is our top pick for a flawless Date Night splurge! Thank You Red Ginger and Thank You Dan. Want to go back and try other selections! Quite a menu. Randy, our server was outstanding! Took his recommendations and were not sorry. Wonderful food and service. Made special requests through open table and they accommodated perfectly. Red Ginger has the best pot stickers and other Asian appetizers, plus the best sushi rolls (like the Red Dragon) in Traverse City, a foodie town. 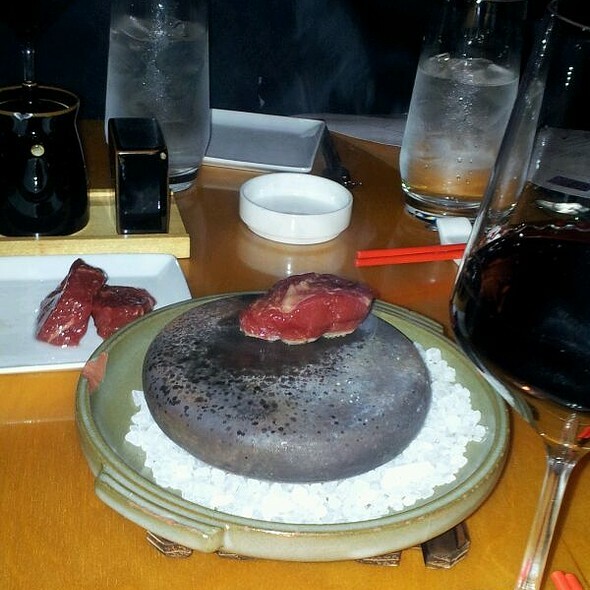 Tastes vary, of course, but my faves besides the above include their beef ishiyaki appetizer. 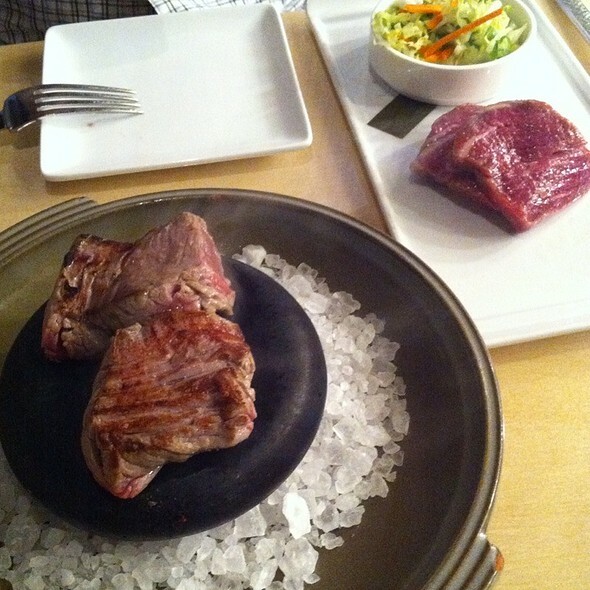 A few small pieces of tender marinated beef to cook to taste on a hot stone (although RG does not have the hot stone technique consistently perfect yet). Ask for the sauce that comes with the pot stickers to enhance the delicious beef. The BBQ ribs are also unusually good. Pad thai, fried rice (lobster is a specialty; 'dirty' rice is very good), and other main larger dishes are very good. Desserts are terrific, too, whether soft chocolate cake or mango rice or coconut cake. You get a chocolate cake bite for your birthday! Lovely ambience. Except can be VERY noisy in summer crowds. Food was not as delicious as previous visits. Perhaps it was our choices. Very expensive to be medium delicious. But we will come back. Ernest made our dinner fun with great service. Have eaten hare before this time the food was not what it has been in the past but still good. We love to come to Red Ginger. I have a garden client who gives me gift certificates every year to your place and I always look forward to coming. Thank you for a great place to enjoy some great food! We come up to Traverse City every year and try a new restaurant. Red Ginger did not disappoint. The food was amazing. Dan our waiter was good. Thi Curry amazing and we had 4 amazing sushi entrees that were awesome. Very busy restaurant. I would say leave your kids at home more date night and special night out. Bar area was packed. I would definitely come back. The losbster sushi was by far my favorite. This place is great. We had been here once before this time and also had an awesome overall experience. The sushi was delicious. I would also recommend the mango rice pudding dessert. 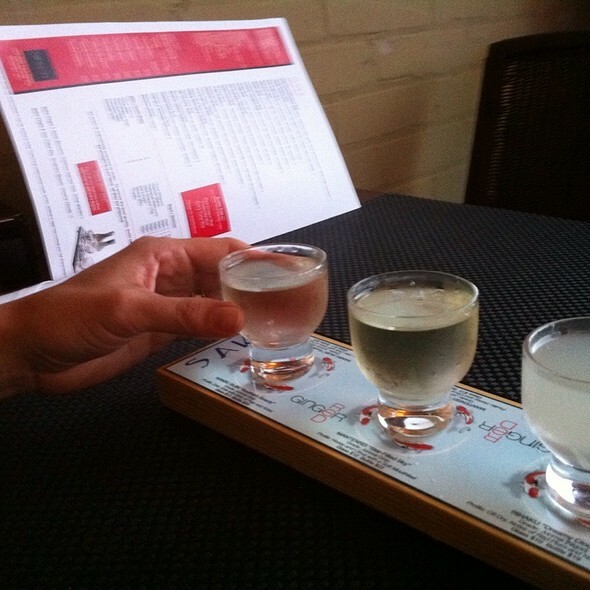 Love the small plates and Red Dragon martini! Excellent service, great food, beautiful and classy setting. Always the best restaurant experience! Love this place! Best restaurant in town. Great service. Great sushi. I’m 2.5 hours away from Red Ginger, but it is still my first choice for an upscale restaurant. I wish they served dinner earlier than 5, but it is always worth the trip. I had seafood Pad Thai & crab rangoons. New favorites!